In the age of serious girl power, Brie Larson recently revealed that her favorite female comic book hero is Wonder Woman. Brie plays the lead in the newest Marvel Studios movie Captain Marvel. In the movie, Brie is an earthling that gets kidnapped by a space race called The Kree. Brie’s character Carol Danvers has to overcome many, many obstacles and stereotypes to pursue her dream of becoming a pilot for the US Air Force. Using her inner strength, will and determination Carol does indeed realize her dream of becoming a pilot, not only a pilot, but an ace pilot. Her boss, Annette Benning, is a maverick herself, a scientist developing a light speed engine that will undoubtedly change the game, not only here on earth, but through the entire galaxy. When the pair crashes with the light speed tech on board their plane, well, Carol’s life changes forever as she transforms into the very powerful Captain Marvel. The Captain Marvel movie is doing quite well with a 455 million opening, showing the studios that strong Female characters are it right now. In a nod to the trend, Brie recently shared that Wonder Woman, played by Gal Gadot was one of her favs. 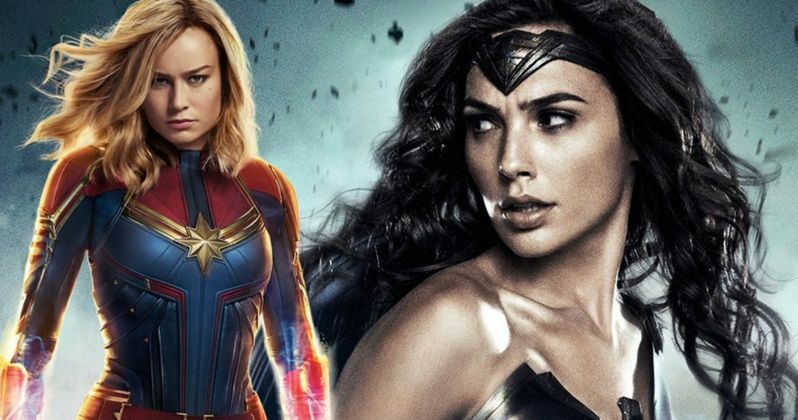 When Brie was walking the red carpet for a premiere of Captain Marvel, she was interviewed by The Female Lead, where she said she thought Wonder Woman was "supercool". Brie Larson also gave a shout out to the strong female Wakanda Warriors featured in the Black Panther movie. When Gal Gadot heard about the nice things Brie was saying about her character, Gal returned the favor by posting fan made artwork of Wonder Woman and Captain Marvel standing together with the caption "I’m so happy for you sister, Congrats". Now Gal was directed in her film by Patty Jenkins and Patty immediately sent her well wishes to Brie when her Captain Marvel film debuted. Patty and Gal shocked the industry with Wonder Woman because the thinking was that a female directed movie with a strong female lead would not work as well as the male driven formula that Hollywood had employed for eons. The pair proved that premise wrong when Wonder Woman pulled in upward of 800 million worldwide. Once Hollywood makes money on something, they of course want to make more, so they signed up both Patty and Gal to do the next installment of Wonder Woman entitled Wonder Woman 1984 coming summer of next year. When Hollywood began featuring strong female characters, female leads, female driven stories, there was a strong backlash all the way around. People in general thought the idea just plain would not work. Well, in Hollywood, the studios go where the money goes and strong box office showings of most of these films, A Wrinkle in Time being the exception, are setting the tone for the future of Hollywood. As long as these female driven films are making money, Hollywood will keep making them. The stories, the actors, the subjects may change but one thing is for sure, the future looks female. Brie Larson’s comments first appeared on The Female Lead twitter.